My spare time today was spent working on my Sketchbook Project sketchbook with the theme, “Mysterious Mapping”. The basis for the project is a labyrinth. I’ve yet to fully realize the end-product. 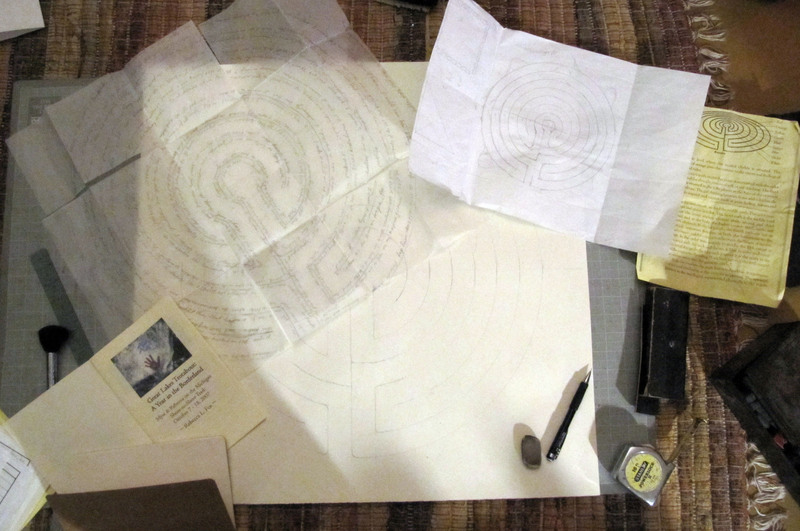 For me the labyrinth is a symbol for pilgrimage and a tool for moving meditation. Several summers ago I created the Trotabout Labyrinth: a seven-circuit, seventy-foot labyrinth that is large enough for two people to walk side-by-side or for a horse and rider. It is dedicated to working in tandem. The Troutabout Labyrinth was part of a much larger project that involved riding my horse, Myst, across the state of Michigan. I serendipitously made the decision to come home the day before tornados went through the forest that I would have been riding through the next day. Safe at home while the storms raged outside, I wrote an essay about this trek. The text from this essay will be the crumb trail through the sketchbook labyrinth. This entry was posted in Animals, Art, creativity, Horses and tagged art, Book, creativity, Drawing, Horses, postaday2011, Work in Progress. Bookmark the permalink.